Figure 1. Prof. Dr. Josef Weizenbaum giving the initial key note address during the DAW Symposium on art and technology held at the ETH Zurich. The key note was followed by two documentary films: Film Presentation "Weizenbaum. Rebel at Work" by Peter Haas and Silvia Holzinger and"8bit" by Marcin Ramocki & Justin Strawhand on art and video games using vintage computers. The tone for most of the festival was set by the keynote address of Prof. Dr. Joseph Weizenbaum, a former MIT professor who developed the world's first banking software for Bank of America, and more importantly Eliza, a computer program based on Rogerian psychology that converses with its user. Weizenbaum suggested that humanity enabled by technology and with a complete disregard for history and consequences has made the world an insane asylum through arrogance coupled with high intelligence. He reminded us that all aspects of reality are not computable and that a machine can have no idea of what it’s like to be human. He also lamented that a great deal of technology has created the “fire and forget” mentality of contemporary society. His solution: leave the asylum. A series five Talk Blocks were given by a selection of artists and researchers from around the world in the Visdome at the top of the ETH main building. They addressed diverse topics like live visual techniques, real-time multimedia composition, globalization and immersive media, and digital puppetry. In keeping with the mood of the festival Marcin Ramocki showed examples of artists using hacked mobile phones and video games while discussing artistic approaches of the DIY generation raised on computers. Stephan Mueller Arisona of the ETH presented digital marionettes which although computerized were controlled by conventional means, and finally in one panel discussion entitled Punk Hactivism and Do-It-Yourself Intervention John deVries of the experimental punk band Agitpop ended his remarks with an emphatic, “My music will never be recorded on a computer,” throwing an intentional analog spanner into the works. Figure 2. The Public Mood Ring project from Will Pappenheimer. 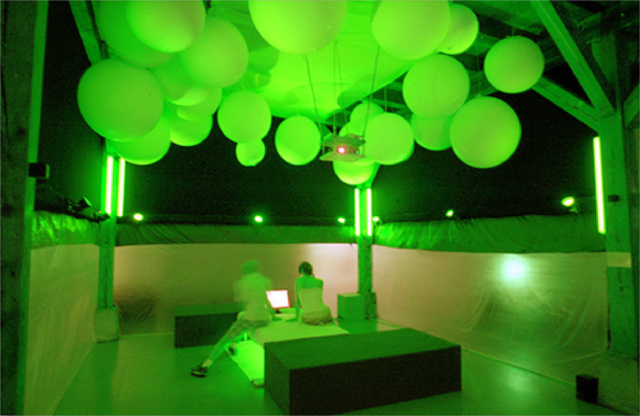 The work is a combined internet and spatial installation displaying the emotional condition of public news stories as color hue. Generally, a mood ring from the 1970s identifies 7 primary moods with ring colors. More in depth accounts list another 7 secondary moods with attendant colorations. The Public Mood Ring uses the total 14 states. However, many of these states are transitional, that is moving from one condition to another. The color green as depicted in the photo would be interpreted as: “ Average but mot active: Normal Reading, active, not under great stress”. The Place Relations exhibition was given at the Kunstraum Walcheturm. The participating artists were Philipp Boenhof and Sven Stauber with “Panoramics in Realtime”, eTeam with “International Airport Montello”, John Craig Freeman with “Imagining Place”, and Will Pappenheimer with his “Public Mood Ring”. These situational artworks investigate the possibilities of real and virtual worlds and online media. In addition the Nova Screen, a 3 dimensional light field hovering above the heads of the throngs in the main train station, intermittently illuminated the art project Swiss ReMake for the duration of the festival. In this project the simulacrum of the Swiss flag was transformed into variations with accompanying text about the reforming of tradition through cultural adaptation, propagating the attitude of J. Weizenbaum who insists that criticism leads to healthy relationships – particularly when directed at establishments. Figure 3. 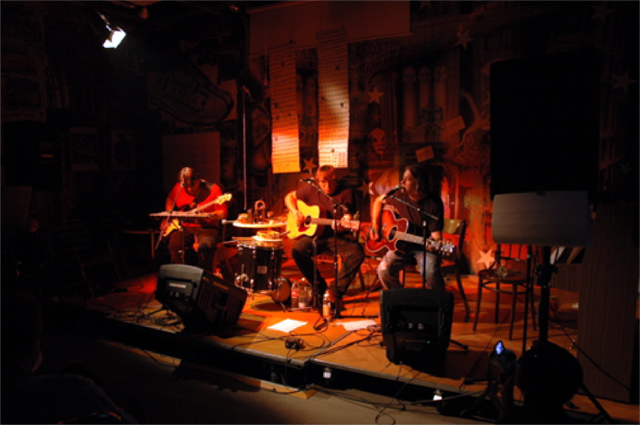 The Agitpop acoustic show which consisted of a selection of well-known songs from their first three recordings under the title “A Shotgun and an Eskimo Kiss” and a second special set dedicated to recent political issues titled “God Bless America, Really”. 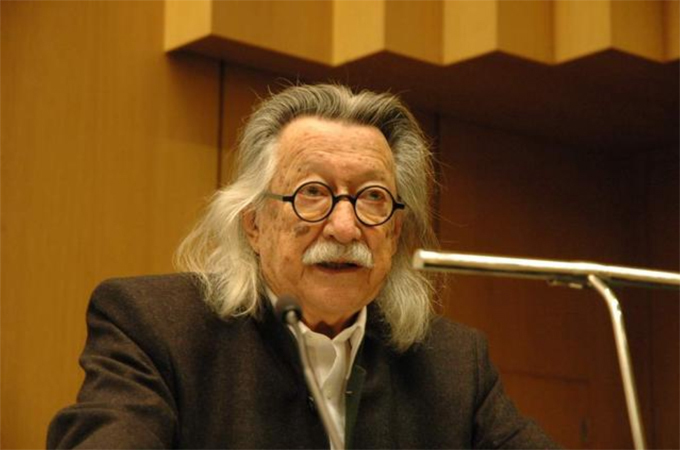 The presentation was in keeping with the “Bad Boy” attitude of Joseph Weizenbaum. Another highlight of the show was a “digital poem” of 0s and 1s that was delivered analog and ending in metaphoric error. The famous Cabaret Voltaire hosted three nights of the Cabled Madness performance series and served variegated cocktails designed by the Claude Gacon of the Cargobar in Basle. The concoctions were named for artworks that were part of the festival and songs of the New York punk band Agitpop, who performed a scathing acoustic tribute to their fatherland, “God Bless America, Really?”, during the Interruptive Performance series. Most of the performances were mixed and included a balance between analog and digital art making. Many works, however, incorporated the newest in technology, exploring in particular the use of wearable technology, including Daniel Wilcox’s and Oscar Ramos’s “Robot Cowboy,” a three part performance of mobile computer music by a digital one man band; “Putzfrau” by Genevieve Favre, who fixed seven lamps to her body, each one corresponding to an original musical sample that she sang while switching the lights on and off in turn; and Benoit Maubrey’s “Feedback Fred,” a wild character whose costume is fitted with loudspeakers and an amplification system and who fell into the audience and poured drinks over himself to the cacophony of feedback and gibberish. Figure 4. 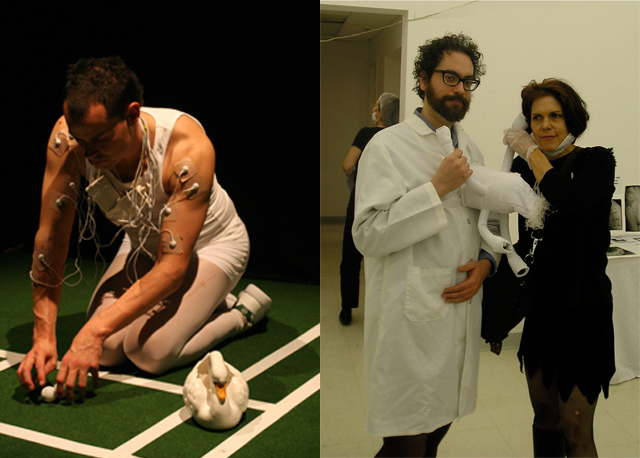 These photos show how wearable technology can be used convincingly in a performance art situation. 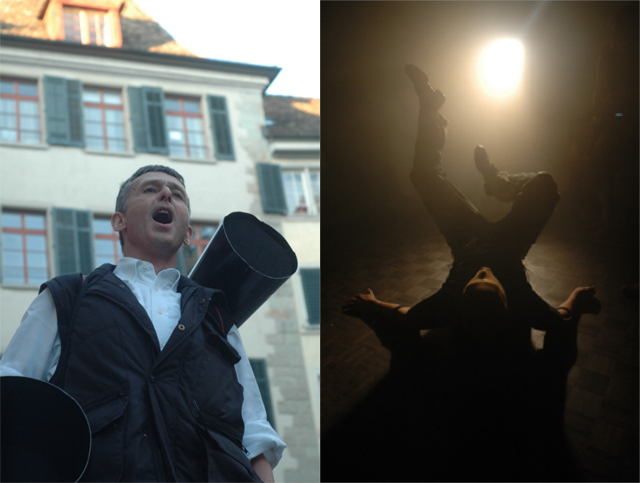 Walter Siegfried performing his “Situative Gesänge” during a walk in and around the Cabaret Voltaire and Benoit Maubrey performing the classic role of “Feedback Fred”. Joshua Rosenstock prowled the cabaret with his wearable robots/soft sculptures that he terms “Sound Parasites”, and Walter Siegfried, who also incorporated a wearable set of loudspeakers, took his audience for a walk outside to listen to his situational singing to a pre-recorded soundtrack enhanced by sounds of the environment. Figure 5. Performances based on wearable digital electronics were given by Senselabor with their “MyMyoMayhem”, by Joshua Rosenstock with his “Sound Parasites” and Dan Wilcox in “Robot Cowboy”, which included using an electric guitar and a computer monitor as helmet. The festival ended with a Finnisage at the ewz-Unterwerk Selnau just outside the center of the city. The full program of art and music began in the afternoon and lasted well into the next morning. Among the attractions was a reconceptualized version of Art Clay’s “Spinoza is(s)t…” performed in the middle of a great hall on the ground floor, where the audience could follow the action as it took place around the set. There was also a long electronic session entitled “The Exploding, Plastic & Inevitable” with music by Steve Gibson, Jackson 2Bears, and visuals by robot_mixeur, Love&Olson, and Scheinwerfer. Agitpop, who after ten years have regrouped and are soon to release a new album, performed an electric set of Velvet Underground covers with string snapping intensity accompanied by visuals from Love&Olson ala Warhol times. Figure 6. An early evening photo from the DAW Finnisage event. 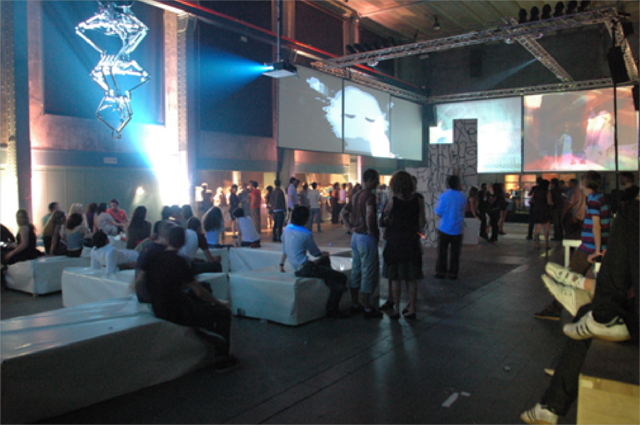 To be seen in the photo are the “Church According to Marshall McLuhan” from Art Clay (front center), “Kubic’s Cube” from Pablo Ventura (top left) and on the screens is a mix of visuals by Corebounce and Love&Olson under the general heading “Plastic, Exploding & Inevitable”. Agitpop performed a set of Velvet Underground covers to matching visuals earlier in the evening. At the back of the big hall was a chill out space with designer pillows and two working versions of Gysin’s and Sommerville’s Dream Machine, while just upstairs were the crawling, drawing spiders of Lars Vaupel set in an backlight environment by Barbara Streiff. After midnight the whole space was transformed into a multi-floor psychedelic dance arena. Performances by Marek Hemmann, Knorlive, Bang Goes, Rino, Co.mini, and Van Nutt transformed the basement as it opened its doors and made the Finnisage a huge party event where guests could wander trancelike from floor to floor. Figure 7. 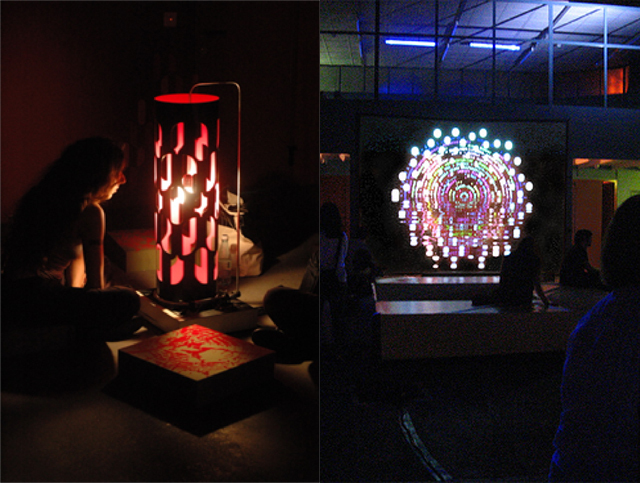 Two of the artworks that made up the 3rd Mind Project. The Dream Machine installation form Corinna Mattner and Sebastian Ulbrich with designer pillows from Art Clay can be ssen to the left. The digital mantra project from Luke Murphy can be seen to the right. Andrew J. Jones was born in Chicago and raised in New York's Hudson Valley. After attending SUNY Cortland, he moved to New York City to pursue a career in publishing and music. In 1996 he and his wife expatriated to Copenhagen, Demark. He is the author of many poems and one chapbook, Paradise, published in 2004. Since 1998 he has lived in Amsterdam, The Netherlands.